Once again, Heather, Alex, Kalyna and I hosted friends from far and wide at our place to ring in the bells once again. And, as tradition would have it, we smoked two 8 lbs pork shoulders, some rib eye steak, smoked salmon, chile con carne and a whole heap of other things. 2015 was a good year but 2016 will surely be better. Thanks to everyone who made New Year’s Eve such a wonderful success. Time to go vegetarian for a few days….or not. A very special thank you to Mr Boon at Huber’s Butchery – he prepped the pork shoulder and was rewarded two days later with the LAST pulled pork sandwich. Thanks Ah Boon… you’re a legend! Hi there dear readers, it’s been a while since our last post and well, for no other reason than I haven’t really grilled anything super fantastic to share recently…until last night that is! This recipe is not complex but theres a bit of prep that you need to do and your timing needs to be on the money just as you’re ready to plate. Combine the marinade together and place the 4 steaks in a large resealable bag. Add the marinade and pop it in the fridge until you’re ready to grill. I let mine sit for about 6 hours. Mix it all up into a sealable jar and give it a serious shaking. This vinaigrette is absolutely delicious on any salad but particularly good on the roasted baby romaine lettuce! Have all of this set up and ready to go because your steaks won’t take very long to grill. Set up your grill for direct heat and get it nice and piping hot. As hot as she’ll go! I used Grill Grates which, for this meal, are essential. The aircraft grade aluminium really cranks up the surface temperature and sears steaks beautifully. Check out the cross hatch marks on ours. Grill the steaks for about 2 minutes then turn 45 degrees for another minute. Then flip them and do the same. If you have an instant read thermometer, pull off the steaks at 130F (54C.) Let the beef rest for about 5 minutes, which is just about the time you’ll need to grill the pears, tomatoes and lastly the lettuce. The lettuce should only roast for a minute or so. You don’t want it wilted. We also used the coffee marinade and made a classic sauce to go with the steak. Simply take a tbsp of flour and mix it with a tbsp melted lard (I used lamb fat) until it makes a paste. Then add a spoonful of the marinade and keep adding it slowly until it all combines. Then bring it to a boil and let it thicken up. You need to get it to boil to kill off the bacteria remaining in the marinade. When you’re ready, slice the ribeye thinly at a 45 degree angle. Place your grilled pear on the plate, add the Gorgonzola cheese in the hollowed out portion of the pear and sprinkle some walnuts and pomegranate seeds on top. Put down the romaine lettuce and tomatoes and give them a sprinkling of the vinaigrette. Lastly, add the sauce you just made and you’re off! Pair this meal with a hearty red wine and enjoy! A special thanks to the Immerman crew who volunteered to be our guinea pigs for this new recipe. Thanks for the wine and whisky of course and all that hilarious dancing afterwards! What a night! So a neighbour was throwing away “an egg” and of course I had to pounce on it, just in case it was a real egg. It turns out that what he was throwing away was in fact a Large Imperial Kamado. The great grandfather of the Big Green Egg… the original deal. Now, when we picked it up (thank Alex) it barely opened and everything was rusted shut. Painstakingly, I took apart all the metal work, bought an angle grinder and went to work restoring this Kamado to it’s original beauty. Some parts were not salvageable but the good thing is that parts from the Big Green Egg were adapted and fit with minimal fuss. A new firebox, fire ring and bottom damper was all it took. I figure I put about $400 back into restoring this Kamado and it was worth every second! It works just as well as an egg, though it probably is slightly less efficient in terms of holding heat in. The difference is that the Imperial Kamado is made of earthenware vs the Big Green Egg which is ceramic. Thanks for chucking away this piece of history neighbour! What a shame that you can’t taste via the internet as this rib-eye roast was an absolute winner! 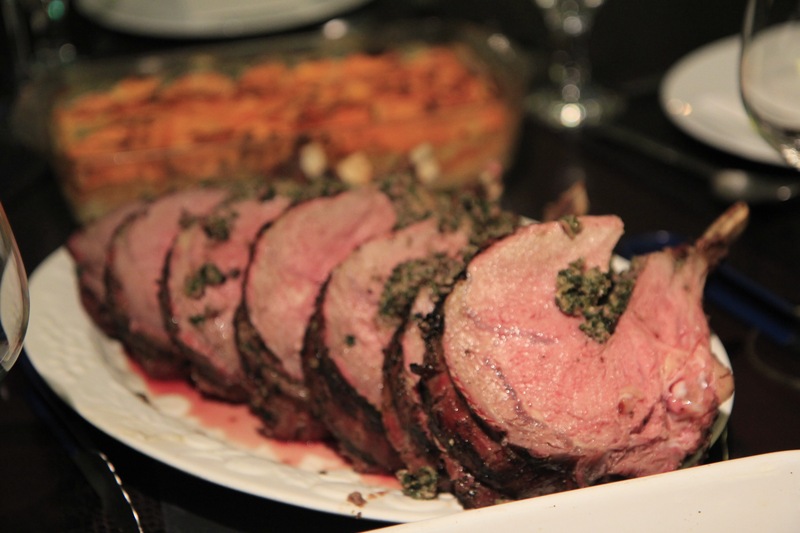 Once again, the Big Green Asian Egg wowed the crowd with a stuffed rib-eye roast that was out of this world. My pal Andrew brought back a Black Angus 8 rib rib-eye roast from Australia a few weeks back. I’d been waiting for the right time to do something with it and that day came yesterday. I had researched how to make a stuffed rib-eye roast and I adapted the recipe do include smoked duck as a substitute for bacon. If you’re up for a bit of work, this roast is incredible and I’d highly recommend you give it a try. As always, the first step is preparing your roast and in this case that means a bit of dry brining overnight. Simply salt the roast with Kosher salt ensuring a decent amount gets rubbed in throughout the joint. Cover it and put it in the fridge over night. You can do the next bit (the stuffing) the day before and it goes a little like this. Pulse up the duck breast and fry it up over medium heat in a pan with a bit of beef tallow (if you have some on hand.) Don’t let it get crispy, just cooked through. Add the celery, shallots, and mushrooms and cook for about 5 minutes or until the vegetables start to go soft. Now add in the spinach and creme fraiche and cook for another 3 minutes. Season as required with a bit of Kosher salt and fresh pepper. Scrape it all into a deep bowl and let it cool down. Cover it with some cling film and pop it in the fridge. You’ll add the eggs an hour before you stuff the roast. Once added, mix it all up with your hands, ensuring an even mixture of stuffing and egg. Then spoon it out onto a baking sheet and smooth it out. Cover it with some cling film and let it set for about an hour to firm it up. The meat has dry brined over night and now you’re ready to create the pocket for the stuffing. Stand the roast up with the bones facing upwards. 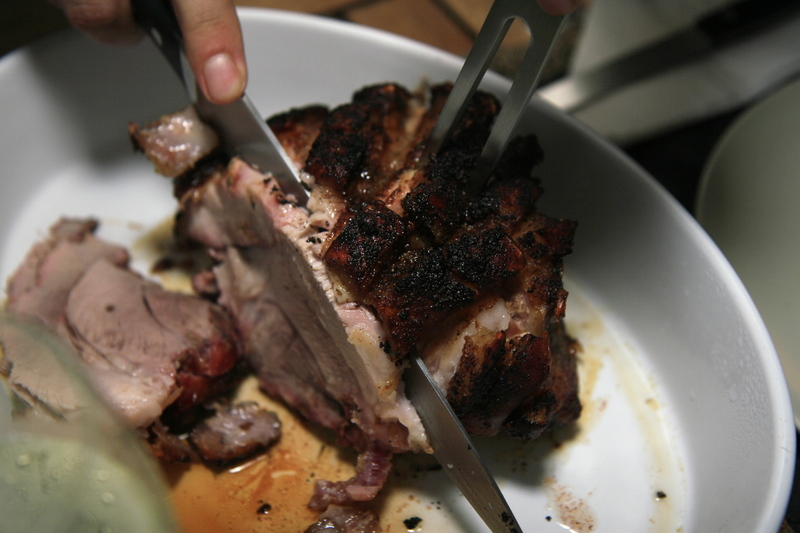 Take a sharp knife and cut a pocket about 1/2 way through the roast about an inch away from the bones. Make one long continuous incision. Now get your stuffing and put a healthy amount into the cavity you created. Take some butcher’s twine and truss the roast between the rib bones. Try to ensure you make the roast look even to ensure even cooking. Once done it’s time to get it on the grill, for a low and slow experience. Set up your grill for indirect heat and stabilise the temperature at 225 degrees F (107C). I added some whisky soaked oak chips for smoke and a drip pan with hot water to create a really humid environment, not that you really need that in Singapore! 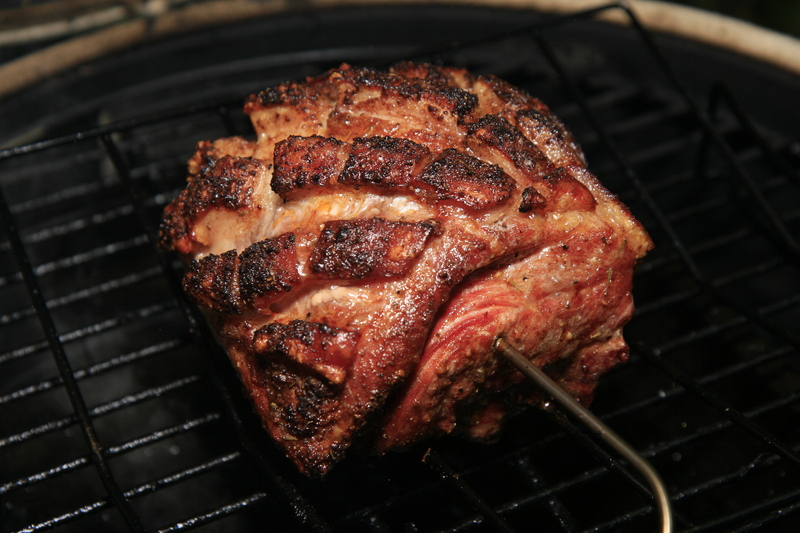 Place the roast on a v-rack above the drip pan, insert your trusty probe thermometer and close the lid. As with any big piece of meat, you need to cook to temperature, not time. This roast should take about 2 and a quarter hours to 3 in total. Once you reach an internal temperature of 125F (52C) remove the roast and fire up the grill to “nuclear hot.” You’ll want to sear the outside of the roast over a very hot grid. Keep the lid open as you really don’t want to continue cooking the inside of the roast, just the outside. Once you’ve got a beautiful crisp evenly distributed over the roast surface, carefully remove it and let it rest for 5 minutes or so. Don’t bother tenting it as you really want the crust to stay crunchy! We served the roast with a halloumi and roast tomato salad and a sweet potato dauphinoise. Heather of course topped the evening with her infamous mixed berry and basil pavlova. What a combination. The evening was a celebration of friendship, fantastic wine and one or two gut splitting laughs, thanks to Rich. This particular post is dedicated to Paul and Rachel Cooper – two friends about to start a new chapter in their lives, post Paul’s retirement! Good luck you two and when you settle, make sure you buy a Big Green Egg. I hope you all enjoy this meal as much as we did. It goes without saying, this was another perfect 10! Two posts in 24 hours calls for a celebration. Last night Heather and I had some amazeballs ribs and tonight we kept the theme going with BBQ prawn, Japanese scallops and a spicy mango salsa that was absolutely to die for. For the prawn make sure you keep the head and the shell on. Take a pair of sharp scissors and gently cut from the back of the head down towards the tail to de-vein the prawn. Nothing ickier than a gritty bit of poo to go along with dinner. Rinse the prawn in water and then simply put them in a heavy duty zip top bag, add about 7 cloves of minced garlic and about 5-7 tbsp of your favourite BBQ sauce. I used the ultimate rib sauce I made last night. Put the bag in a metal bowl and back into the fridge for a few hours. Place your prawn on the grates evenly spaced apart, not touching each other. Grill on one side for 3 minutes then flip and grill for another 3 minutes. Remove the prawn and transfer to a dish and cover it with aluminium foil. Finish up the prawn and place it on the dinner table. Heather took care of the scallops, drying them first for a number of hours, then simply seasoning with S&P and into a hot pan with some butter. The mango salsa consisted of honey mango, cucumber, mint, a fresh chili pepper from our garden, green onion, lime juice, olive oil, Kosher salt, avocado (to cut the heat a bit) and cherry tomato.Simply amazing! The prawn were juicy, garlicky and just enough sauce on the shell to make for an amazing and wonderful Sunday meal! If you’re looking for the Ultimate rib recipe, look no further…ladies and gents here it is. This is a variant on a few different recipes I’ve researched, pulling together what Heather thinks are the BEST ribs ever on the Big Green Asian Egg. So here’s what you’ll need to do! Let’s start with preparing the rub. Many BBQ cooks keep their rub recipes a secret. That’s just plain silly in my opinion unless of course you’re competing in a competition or running your own restaurant. If you don’t share, the rest of us can’t get better at the craft. Take the spices above and toast them in a small dry skillet over medium heat. You’ll know when it’s done when you get this amazing waft of spice filling your kitchen. It takes about 3-4 minutes in all. Remove the spices and let them cool a bit before transferring to a spice grinder. Now add the following to the spice grinder and pulverise it to a nice fine grit. Grind it all up and set it aside… your ultimate rib rub is now done. Bring the sauce to a boil and then reduce the heat to low and let the sauce simmer (uncovered) for about 25 minutes. It’ll thicken up before you know it and it’ll go a gorgeous deep reddish brown colour. Let the sauce cool and then transfer it to an airtight jar. The sauce is good for 3 months however I’ve never ever seen enough to last more than a few weeks in this house! Right, so now you’re done the necessary prep. Let’s get the ribs sorted next. I purchased two slabs of frozen St Louis cut ribs from the local Singapore equivalent of Costco, The Warehouse Club. They were $9/slab and easily twice the size of the ribs I normally get from our friends at QB. Frozen ribs are fine by the way, though I do like to go to the wet market and occasionally buy fresh chilled pork, but that’s really for special occasions. Thaw your ribs a few hours ahead of time, rinse them under cold water and then pat them dry on your cutting board. Some people insist on removing the silver skin. I don’t bother as it hardly makes a difference. Take a bit of vegetable oil and coat both sides of the slab. Now take your rub and give both the top and bottom a good liberal coating. Don’t forget to get the sides ensuring you get some rub between the bones. Now take each slab and wrap them tightly in some heavy duty aluminium foil. Try to make an airtight packet so that the juices don’t run out. Now place them in the fridge for a few hours. The longer the better. If you’re pressed for time, that’s ok too but I like to let the meat try and absorb the rub as much as possible. Set up your grill for indirect heat with a drip pan full of hot water. Even though the ribs are protected in the foil, you want to ensure you’ve got a nice humid environment under the hood. Stabilise your temperature at a medium heat around 325F (163C). Put the ribs on a rack above your water pan, close the lid and let it rip for 2 hours. Once your timer pings, carefully remove the packets from the grid, set them aside and now fire up the grill to get it as hot as it can. Carefully cut a corner off the packets and drip any of the juices that have remained into a pyrex measuring cup. Unwrap your ribs and get them onto the hot grid. Timing isn’t that critical here so you don’t have to rush. Put the ribs meat-side up and paint them with the sauce you made a few hours earlier. Make sure your sauce isn’t cold, right out of the fridge. I keep it handy at room temperature as I baste any meat. After about two minutes, carefully flip the slabs and paint the bottom side of the ribs. Keep flipping every two minutes or so to get a wonderful caramelisation across the ribs. Crisp them up carefully with the lid open and for the love of God, don’t walk away, the ribs can burn quite easily. Remove the ribs when they’re nice and crispy and serve the slabs whole. Let your guests take as much or as little as they like. We served the ribs with an amazing ratatouille incorporating roasted red pepper, tomato, onion, garlic, Italian herbs, feta, parmesan and mozzarella cheese. If you check out the photos, you’ll clearly see that the family LOVED these ribs. In fact, my darling bride Heather proclaimed quite categorically, these were the BEST ribs we’ve ever had. Naturally, I took a bow and immediately wanted to share this recipe with the world. Let us know how it goes! And spread on your toast. of the very best egg yet. The likes of which you’ve never seen. That is definitely heart stoppin’. Is Roman, the chef supreme. Can’t fail to put a smile on your face. Of this feast he’s prepared for you. For Roman and his Big Green Egg barbecue! My wonderful, adorable and hilariously funny mother-in-law is a bit of a poet. She penned this ode to the egg on her latest visit to Singapore in March. I think both Granny & Papa enjoyed the fruits of the egg and it was only fitting to pay homage with prose. Thanks Maw… one of my favourite poems yet! A quick post for a Monday night. As if weren’t enough that we ate our faces off over the weekend, I had 4 pork chops in the fridge that needed to be sorted out. What better way than to use a tried and tested method of “reverse searing” and come up with an amazing dish? When you’re ready to prep, take your chops out of the fridge, give them a rinse under cold water and pat them dry. Drizzle a bit of vegetable oil on the chops and sprinkle a good helping of your favourite rub. Last night I used a pre-made rub (I know, I know…I just couldn’t be asked to make my own!) The rub I used was Cape Herb & Spice, Smoky BBQ Braai seasoning. Braai is the South African style of grilling and I suppose this spice was meant to reflect a typical Braai rub which included brown sugar, coriander, paprika, black pepper and something quite dodgy called “flavour.” Give it a good coating and pop it back in the fridge until you’re ready to grill. Set up your grill for indirect heat and stabilise at 225F (107C). When ready, place your chops on the grid and make sure you’ve got a good probe thermometer to track your progress. I had a few chops that were different in size and thickness so to be extra sure, I used my Thermapen which gives you lightning fast readings without you losing too much knuckle hair. Flip your chops ever 15 minutes or so until they all reach about 125F (52C) then pull them off and tent them with some aluminium foil. Now the fun part…. Remove the plate setter or simply turn up the grill to maximum temperature. I removed the plate setter and inserted my trusty “Grill Grates” to get that extra special sear! When you hit “stupid hot” paint your pork with your favourite sauce and place the chops on the grid. 2 minutes later, give them a quick 45 degree spin for another two minutes. Now flip and do the same thing adding a bit more sauce. Grill for 2 minutes, 45 degree turn and then grill for another 2 minutes. Check your temperature with a probe thermometer as you’re finishing the sear. Note that you should remove your wired probe when you’re searing. The heat off the grid will render your probe absolutely “kaput!” This is where a thermapen comes in really handy. Pull the chops off at 143F (62C) and let them rest for about 5 minutes under a lose tent of aluminium foil. We served up these chops with some garlic fried rice and cheesy broccoli. Absolutely easy and absolutely tasty!